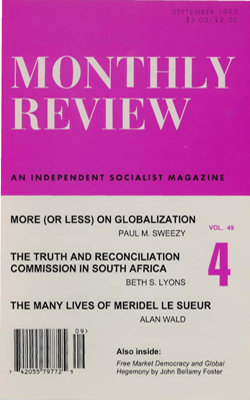 Belief in the possibility of socialism has waned as the so-called socialist countries have reverted to capitalism and as capital has once again expanded the scope and depth of its rule. Yet a self-managed, democratic socialist society has never been more possible. The material possibility of socialism, as reckoned in the sheer productivity of industry and the availability of masses of goods and services, has existed for most of this century. Now the technical basis for the process of managing those things, i.e. for the process of socialism, has taken huge leaps forward with the advances in information technology of just the last few years.